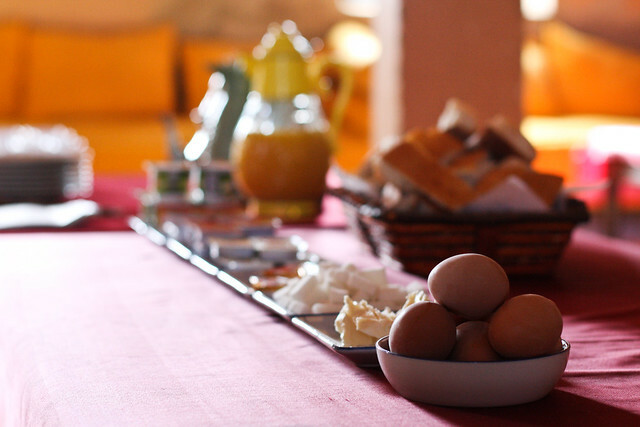 Marrakech to Ifrane in 3 Days | As I blog. 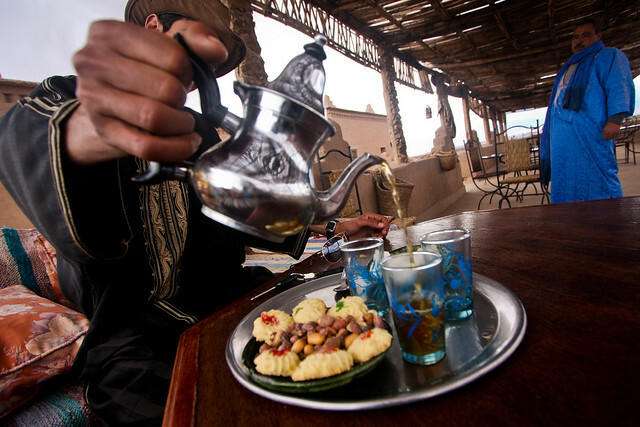 I had work scheduled in Marrakech and Ifrane, so instead of flying, I decided to take a 3-day road tour with Authentic Morocco. 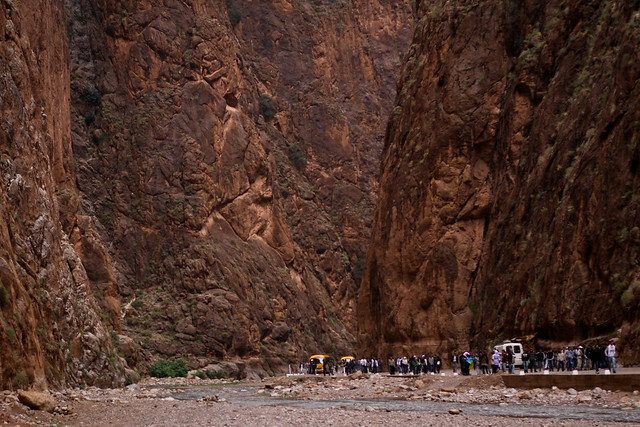 My driver, Abdul, picked me up at 8:00 sharp, and we headed out of Marrakech and into the High Atlas Mountains. The landscape made it immediately clear why these mountains are a popular hiking and trekking destination. 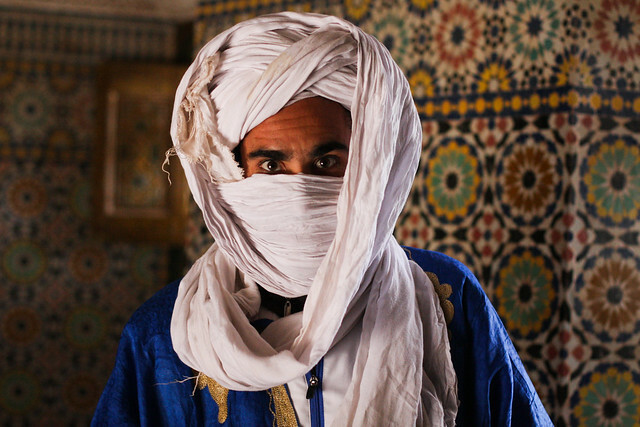 We took a small detour to visit the Berber city of Telouet, a Kasbah along one of the former caravan trade routes from Marrakech to the Sahara. It used to be the seat of the El Glaoui family's power, but has since been raided and is now just a crumbling ruin. My guide in Telouet. His English was terrible and my French is terrible, so we got along great. 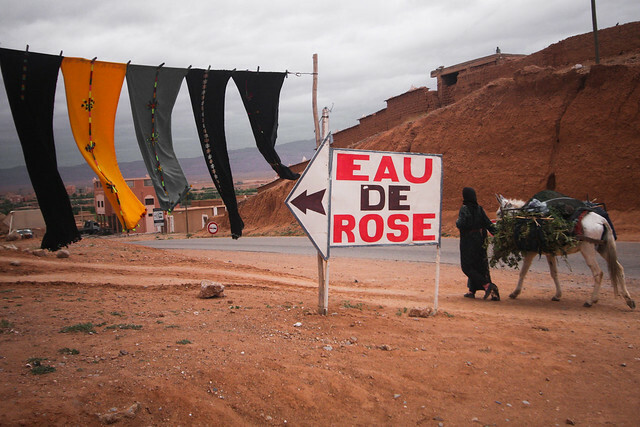 After a short tour and a road-side tagine, we continued through the mountains, passing through pink salt mines and mountain villages, and stopped at Ait Benhaddou, one of Morocco's most amazing fortified villages. 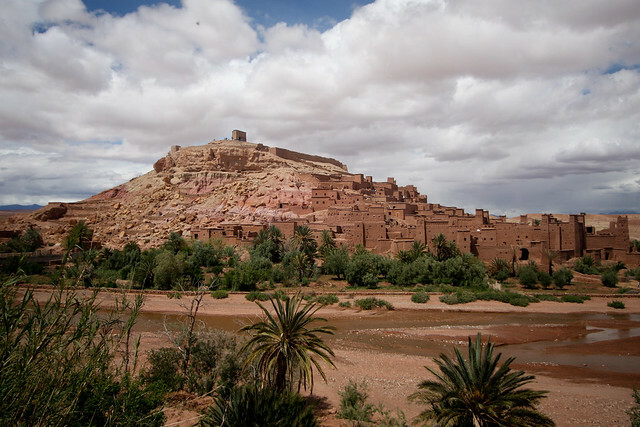 Ait Benhaddou is also the setting of many movies filmed in Morocco, include "Lawrence of Arabia", "The Mummy", and "Gladiator." 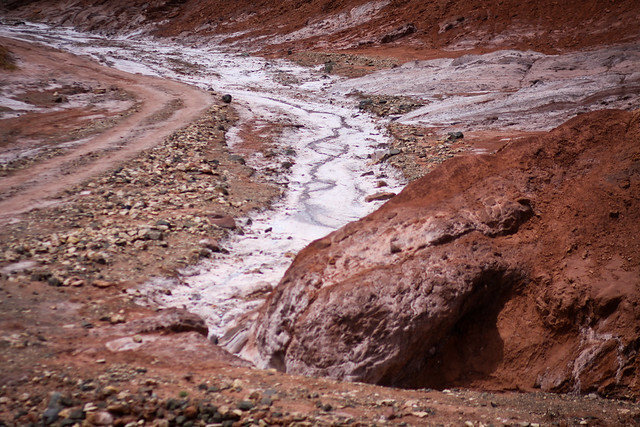 Pink salt mines in the Atlas Mountains. 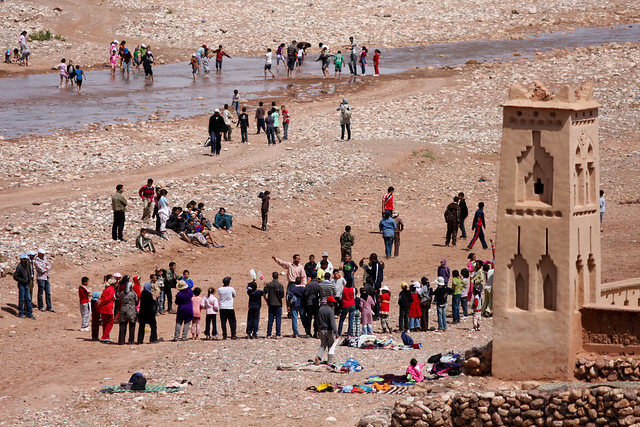 Syrian movie "extras" taking a break in a stream near Ait Benhaddou. 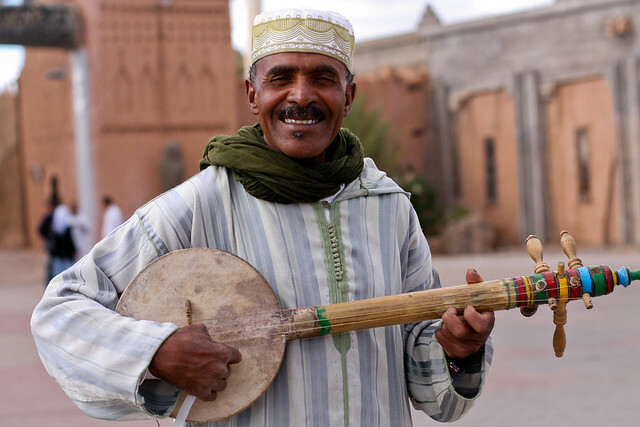 After another hour on the road, we stopped in Ouarzazate to stretch our legs and ended up getting a short serenade from this fine fellow. 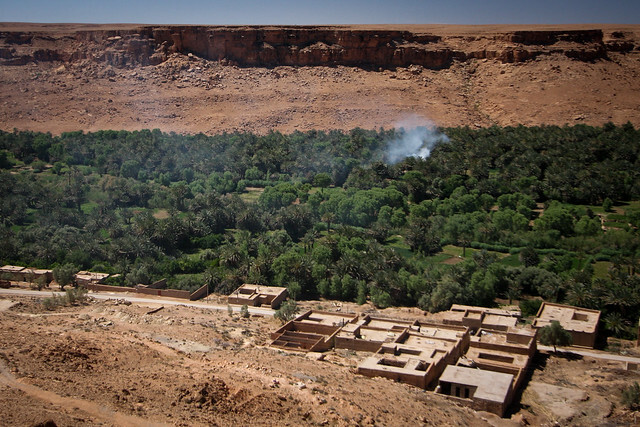 We ended our day in Skoura at Chez Azis, a Berber family hotel, that overlooked the miles of palm grove in the Skoura oasis. 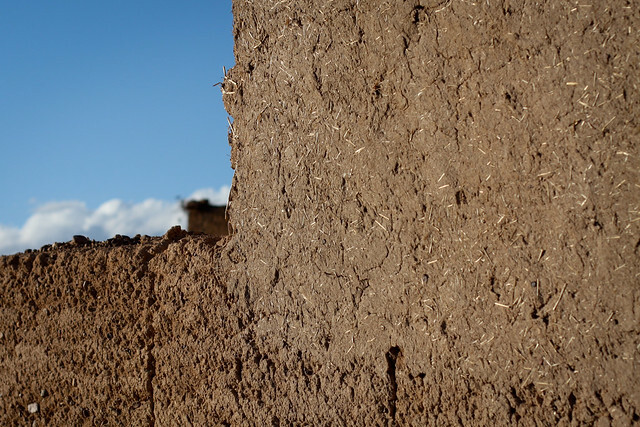 Chez Asiz, like the other hotels, is constructed in the traditional Berber style using mud brick and mortar. 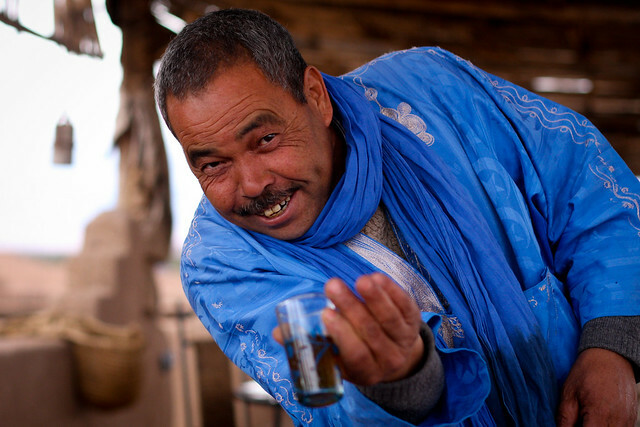 Berber whiskey and cookies upon arrival in Skoura. Asiz, owner of "Chez Asiz"
I started day two with a large breakfast of fried crepes, jams, orange juice, and coffee, and then bid Azis and Skoura goodbye. 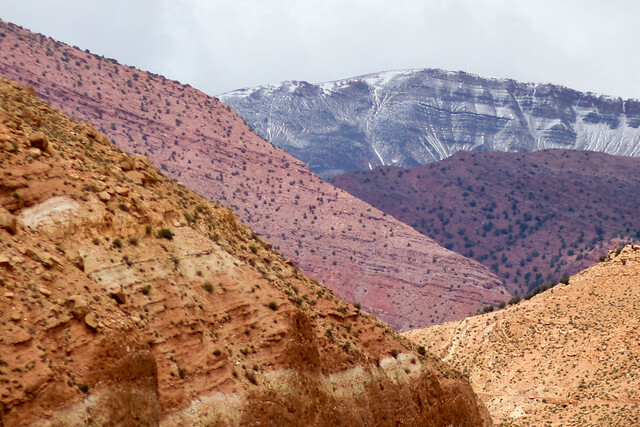 We continued driving through the mountains of orange and green and stopped briefly at the Todra Gorge to get a view of the spectacular canyons, then continued on to Merzouga. 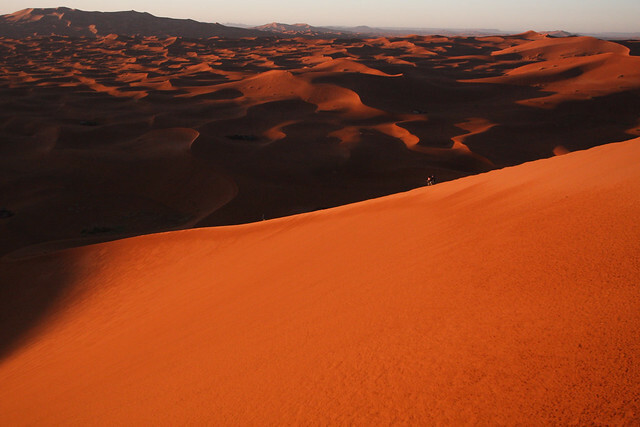 Once in Merzouga, we went off road for 15 km until we reached the edge of the Erg Chebbi, one of the two Saharan ergs (areas of large sand dunes). 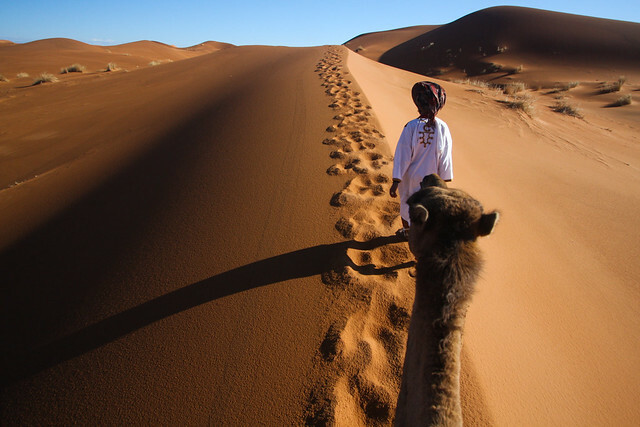 Abdul bid me farewell and I set off on camel to spend a night in the Sahara with a group of Australian travelers and our camel guide, Mustafa. 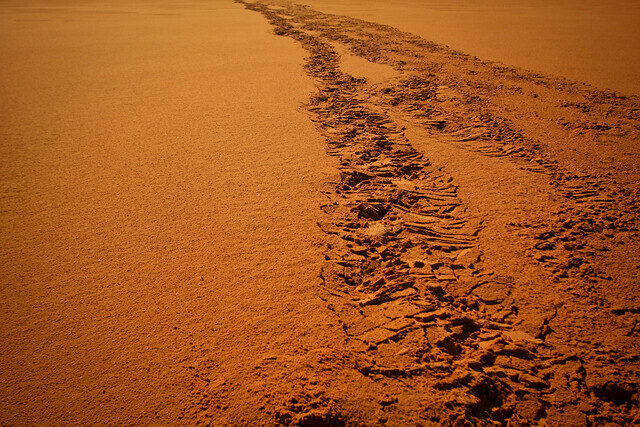 I'd expected the stereotype: a relentless and scorching sun beating on the dry desert. What I got was cold, wind, and rain! Mustafa was practically dancing because of the rain, an exciting and infrequent event for him, while the rest of us layered up and wrapped our head scarves tighter around our faces to keep out the biting wind and sharp sand. I'll be honest... I was freezing. 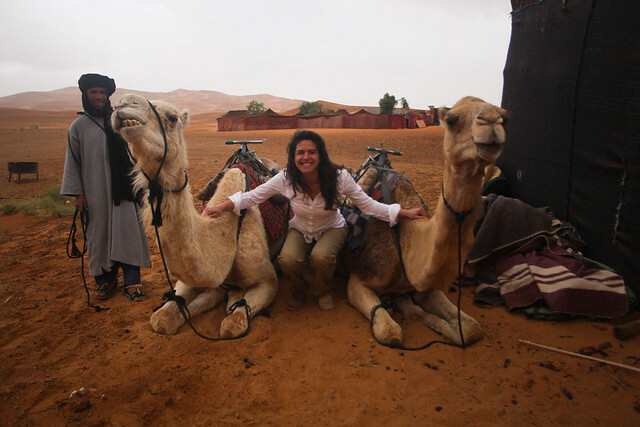 Post-camel trek: happy, cold, and wet! Alas, we made it to camp and shortly after we'd hung our scarves up to dry and found blankets to wrap ourselves in, Mustafa brought us Berber whiskey and salted nuts, and all was well again. After a tagine dinner, we warmed ourselves around a camp fire and got lost in a brilliant starry sky. 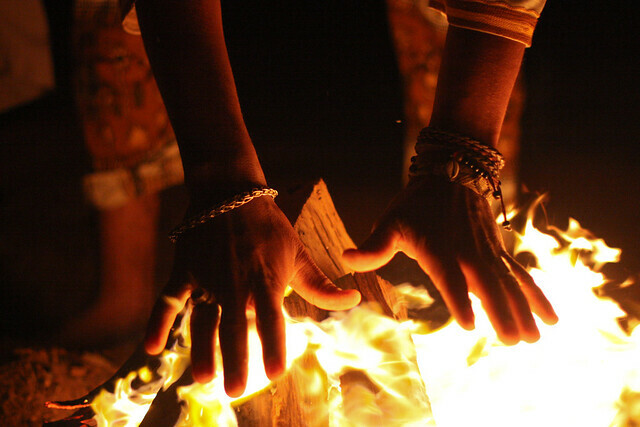 Mustafa warming his hands on the fire. I woke up at dawn to climb one of the nearby dunes. Climbing a sand dune is... hard. It's very hard. 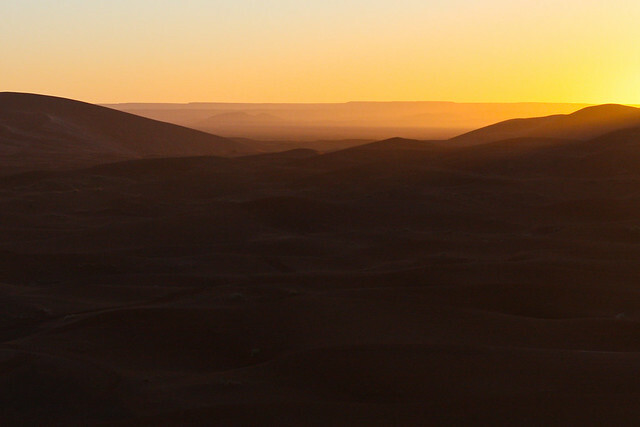 Each step is heavy and sinking and the effort I was exerting never seemed to match the small distance I was covering upwards, but after some huffs and puffs, I made it to the top and watched a quiet sun rise over the burnt orange dunes. My tracks climbing up a dune at sunrise. 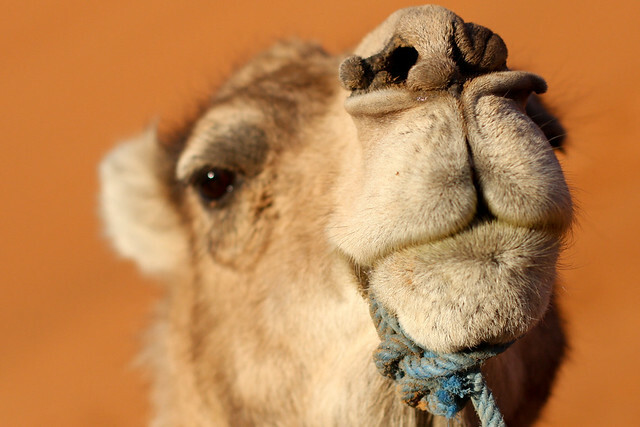 The rest of our camp woke up, we packed, hopped on our camels, and set off back to Merzouga for breakfast. 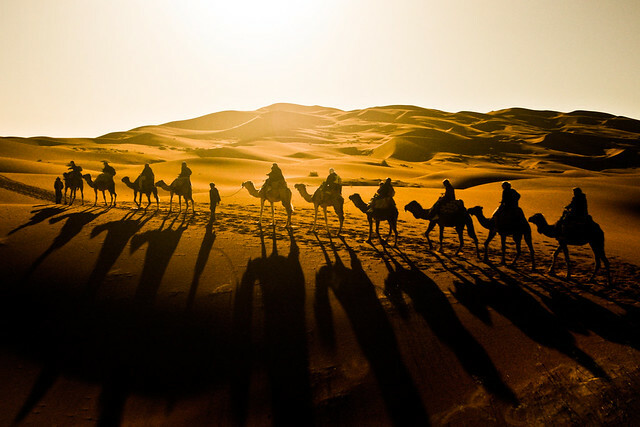 Another group trekking in the desert. My view atop a camel. 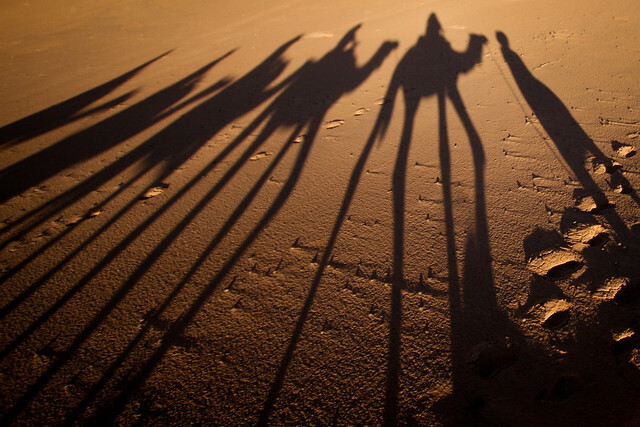 Camel shadows in the sand. 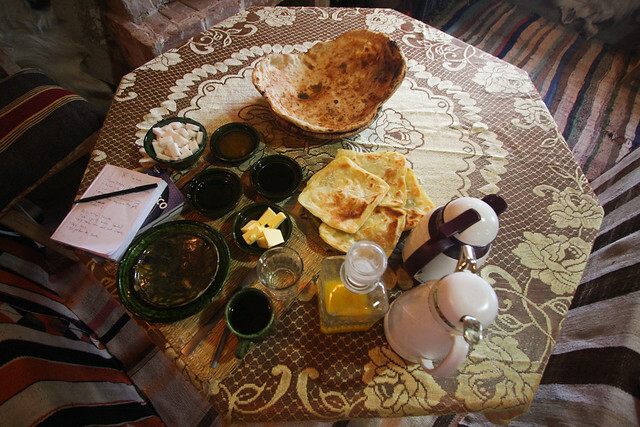 A quick breakfast in Merzouga, an icy cold shower, and Abdul and I set off on the long drive to Ifrane. Our third day was filled mostly with driving, through the Ziz Valley Gorge, Azrou, and the Ceder Forests. We passed more palm groves, mountains, and nomad settlements. Palm grove. The smoke is from the Berber bread baking. 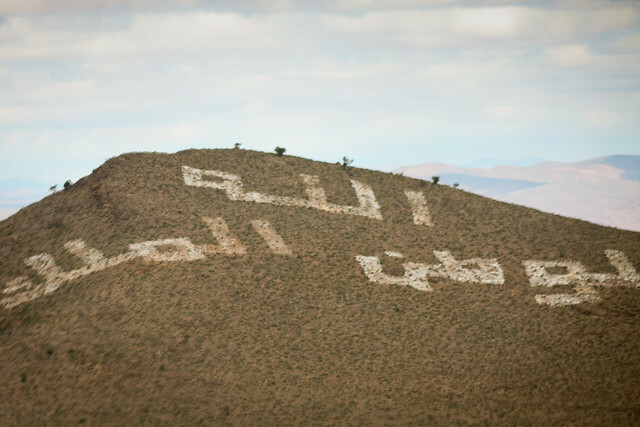 "God, Country, King" in Arabic. 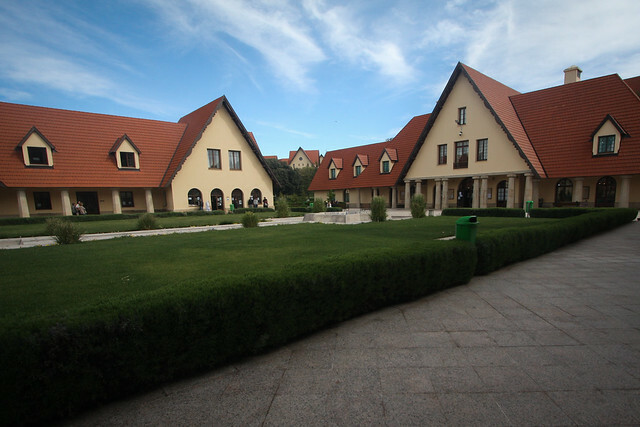 In the early evening, Abdul dropped me off in Ifrane, where I was scheduled to do a tech talk at Al Akhawayn University the following day. 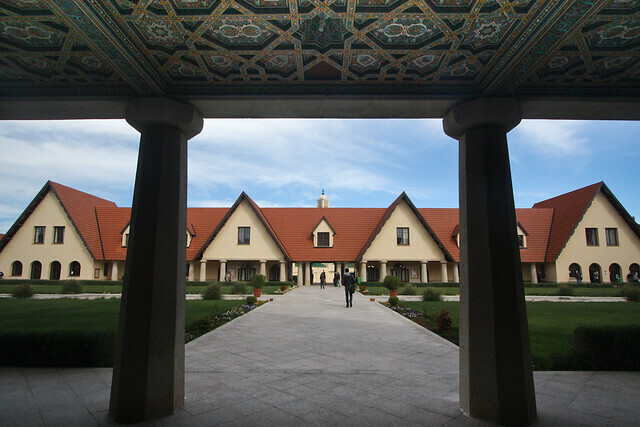 Ifrane is lovely and pristine and unmistakingly earns its nickname, "Little Switzerland." 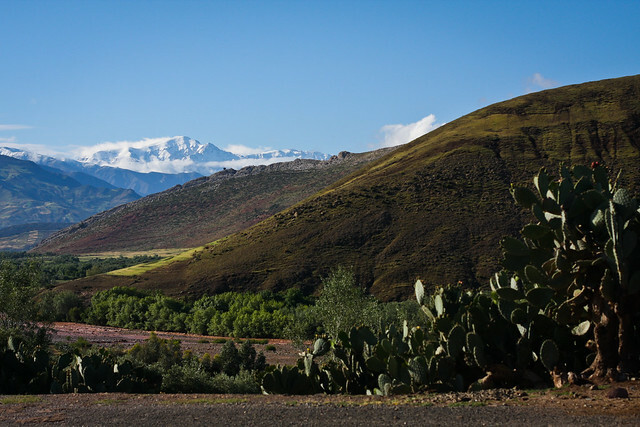 It looks nothing like the rest of Morocco I visited, but it's easy to understand why it's a popular skiing and resort destination for rich Moroccans and tourists. 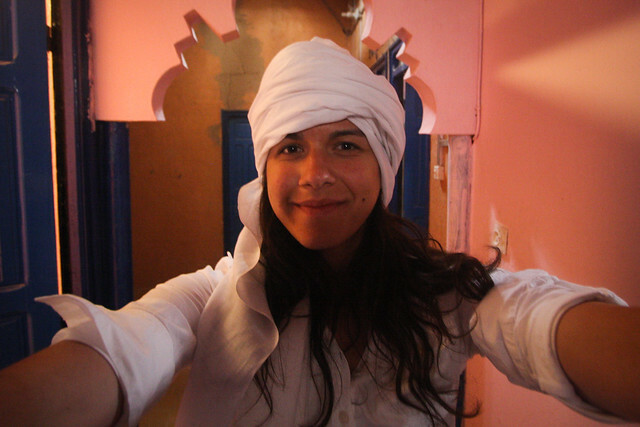 And that concluded my very mini-tour through central and southern Morocco. It was an incredible experience, filled with many colors, tastes, friendly strangers, and memories. 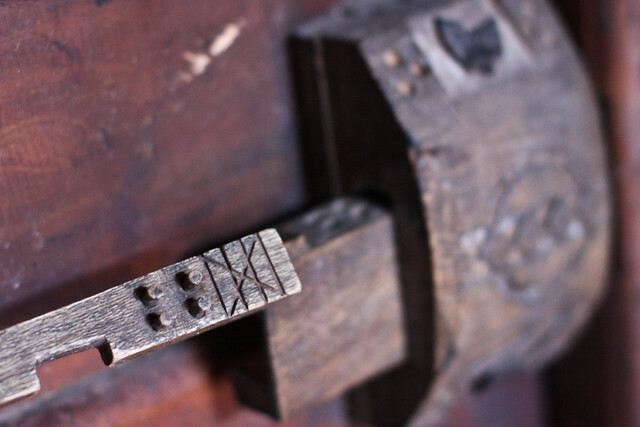 Oh, and pictures!